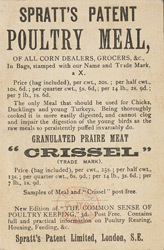 James Spratt was better known for producing dog biscuits, but as this advertisement shows he also tried his hand at poultry feed. This product was clearly aimed at the metropolitan poultry keeper. As late as the 1890s it was not uncommon for citydwelling householders to keep chickens and other small animals as part of their domestic economy. In the 1870s Spratt employed a salesman who would go on to become more famous than he was: Charles Cruft, the originator of the annual Cruft's dog show.